Sunday February 19th, 2017, 2:00 PM at Culpeper Baptist Church. The church is located at 318 S. West St. Culpeper, Virginia. The rules and regulations for the 2017 contest are available at this link. Most of the citizens of Culpeper County are aware of the primary mission of the International Lions Clubs. That mission is simply to provide financial assistance to citizens in their local area of responsibility with resources required to improve their quality of life regarding sight and or hearing deficiencies. During 2016, the three Lions Clubs in Culpeper County (Culpeper Mid-Day, Culpeper ’92 and Culpeper Dawn) provided financial assistance to 188 citizens for assistance in procuring eye examinations, lenses and frames. 10 citizens were provided assistance in the procurement of hearing aids. This assistance is made possible from the profits from the Mid-Day Lions Sunday Night Bingo and contributions from Club 92 and Dawn. The dominate reason for this assistance are the local loyal patrons of the Sunday Night Bingo held at Peppers Grill each week. Not to be overlooked is the contributions made, especially in the sight area of the local firms and doctors specializing in eye related deficiencies. As always we the Local Lions are proud of these contributions made to our citizens. 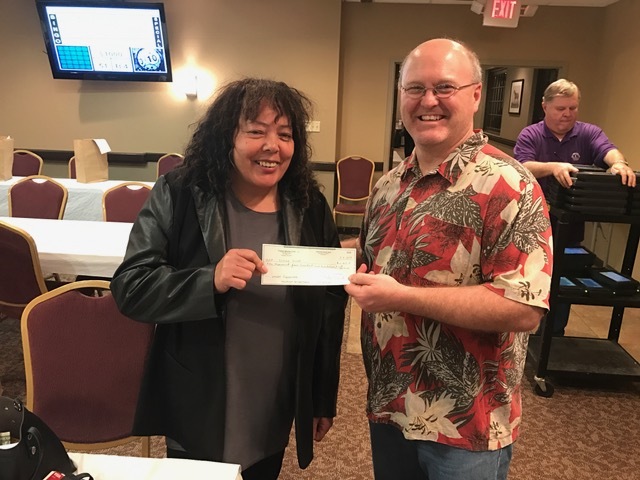 Funds in excess of those used address the sight and hearing needs of our community are used for various charitable organizations such as the Food Closet, Hospices, school lunch programs, scholarships and the soap box derby events. 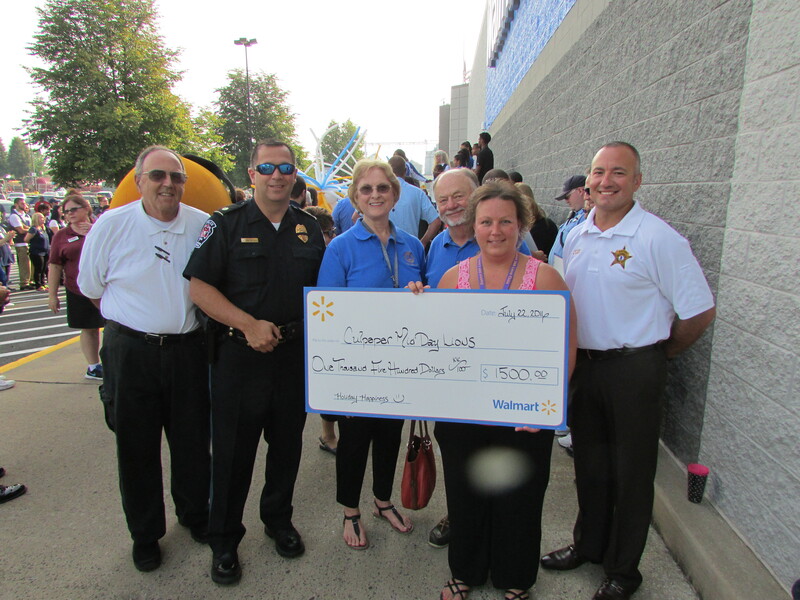 Culpeper Mid-Day Lions Club was honored and privileged to receive a $1,500 grant from Walmart Corporation this past Friday, July 22, 2016. Through the hard work of Lion Stacey Nicholson, Mid-Day was granted the award to supplement the annual gift giving that the Lions hold each year. The grant will help to further the annual Christmas Shopping with the Kids event that is held each December by the club. 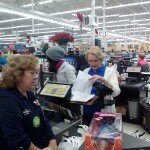 The event helps to purchase gifts and presents for under-served children and their families in the Culpeper area. 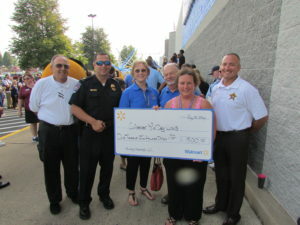 The club is thankful for the generosity of Walmart and looks forward to using the funds to help further their donations within the community. Lions present for the presentation included from left, Bruce Hundley, Chris Settle, Lawanna Stanton, Hank Milans, Stacey Nicholson and Nick White. 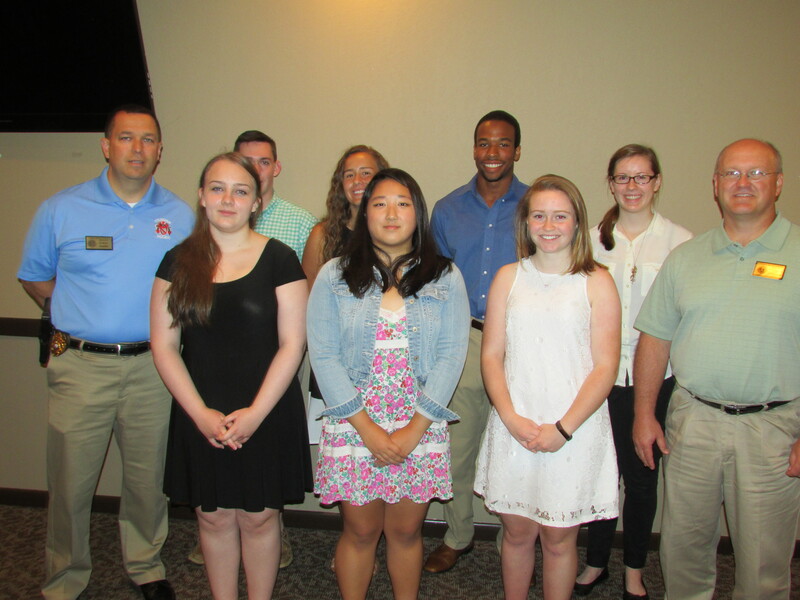 The Culpeper Mid-Day Lions were privileged to welcome the 2016 Scholarship recipients from both Eastern View and Culpeper County High Schools to their General Membership Meeting on Thursday, June 23, 2016. Seven of the nine winners were able to be with us. 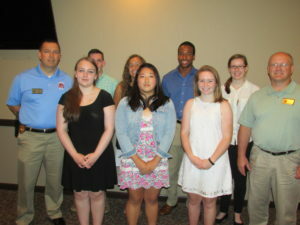 A photo of the graduates is included below standing with LEO Adviser to both High Schools, Chris Settle, far left and Lion President Lee Simpson, far left. It is an honor to be able to provide assistance to such an outstanding group of graduates who have proven themselves over their four year high school career. The graduates pictured include back row far left: Harrison Sublett, University of VA; Lexie Bates, James Madison University; Nathan Stewart, University of VA; Kirsten Busse, Brigham Young University. Front row far left: Keely Martin, Lord Fairfax Community College; Jieun Kim, University of VA; Daphne Sink, College of William and Mary. The Culpeper Mid-Day Lions wish success to all of the recipients and to Shana McMeans and Matthew Heinrich who were not able to attend the luncheon. 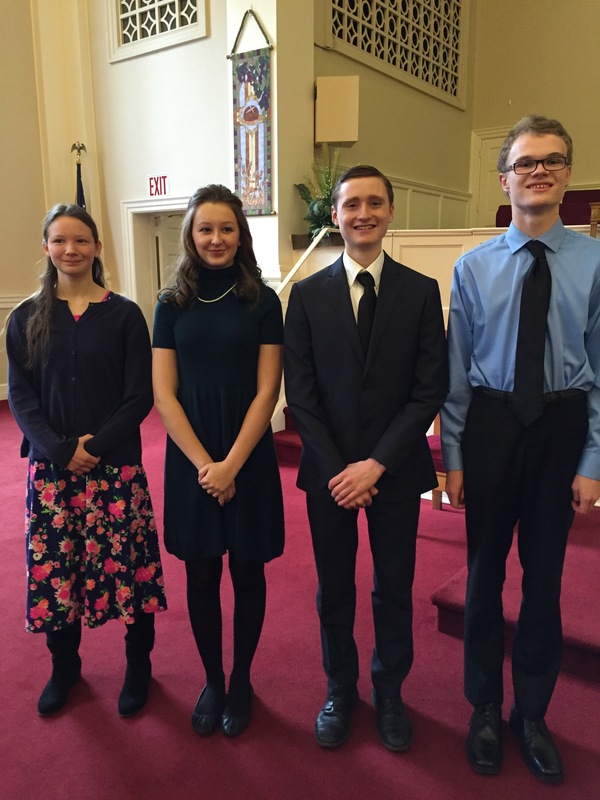 Culpeper Mid-Day Lions held the area Bland Competition on February 7th, 2016. A nice crowd attended the event held at Culpeper Baptist Church in Culpeper. A picture of the winners is attached to this post. Philip Grotz won 1st Place in the instrumental competition. Edwin Cutright was 2nd place instrumental. In the vocal competition, Emma Butler won 1st place and 2nd place went to Lindsey Sanders. Overall ten total contestants were apart of the competition. The top place finishers will move on to the Area competition that will be occurring in March. 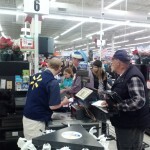 Lions Bruce Hundley and Bob McCall checking out shoppers. 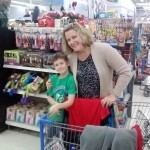 Farmington Elementary Teacher Kelly Baker helping out a elementary shopper. With more than 15 Lions involved and help from James and Eddie at Peppers Grill, The Culpeper Mid-Day Lions shared Christmas with just over 90 children in Culpeper County. 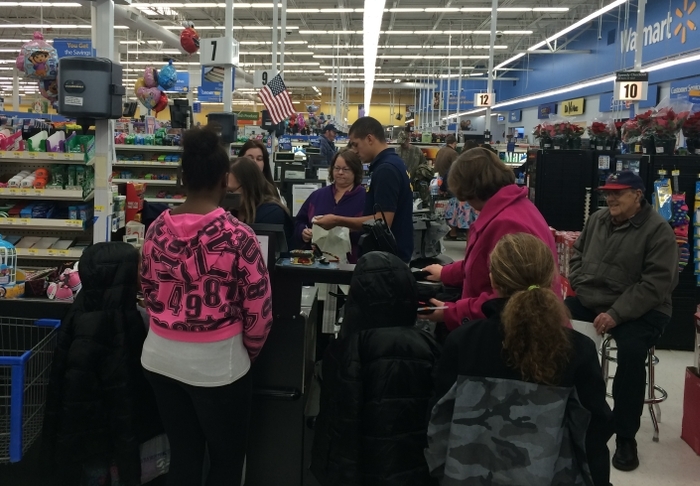 Each child was given a budget of $60 to shop for themselves, family or friends. Each child was also feed brunch by Pepper’s Grill. The counsellors and teachers of each elementary school was represented during the event. Thanks to everyone who helped and made the event a huge success. This event took place on 12/12/2015. Lion Bruce Hundley (seated at right) enjoys watching local children shop at Walmart as part of the Lions Christmas Shopping program. This year the club donated almost $6,500 in gifts and meals to local families in need. Lion Rev. 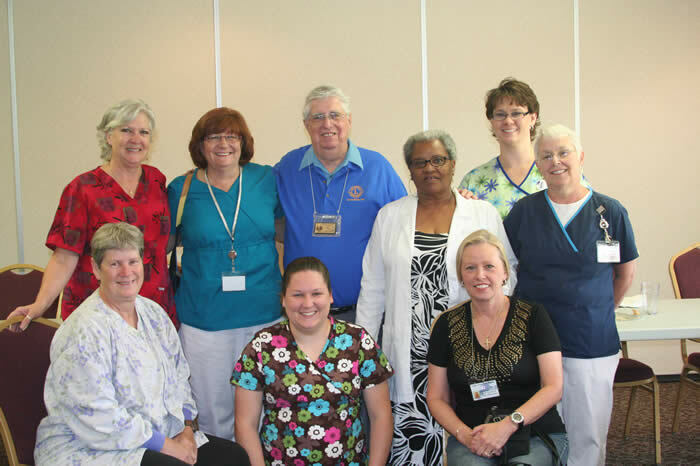 Bob Donnelly with the school nurses that assist the Culpeper Lions Clubs with sight and hearing screenings and help to ensure that all Culpeper School System students have glasses whenever they are needed.